Not only do buckets belong on every shelf in your house, they are perfectly capable of being the shelves themselves! 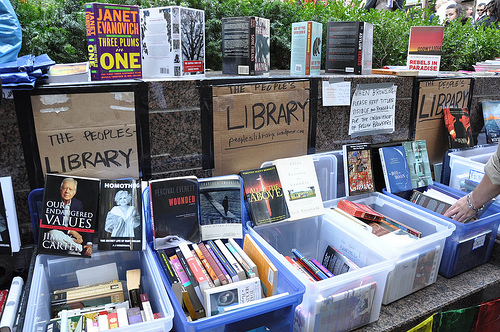 The most well-know bucket shelving was at the Occupy Wall Street “people’s library.” The entire library was designed to be packed up at a moment’s notice if the police cracked down on protesters. The biggest reason to use buckets for shelving are their portability. I remember spending hours with a sledge hammer when we broke down our shelves in Denver. Those shelves were lovingly custom crafted out of heavy oak water bed boards. I think they ended up as firewood. If they had been made of something repurposable like a 5 gallon bucket, I guarantee their component parts would still be with us today. 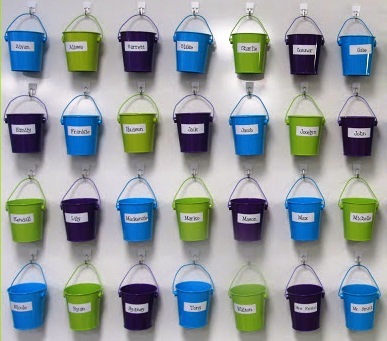 The biggest challenge in building bucket-based shelving is that standard 5 gallon buckets taper toward the bottom, which means that each additional bucket layer you add tilts your shelving unit more toward the ceiling. One group of guys actually used this to their advantage in building the bucket igloo. There’s a few ways of dealing with the angle problem. This article will cover four. 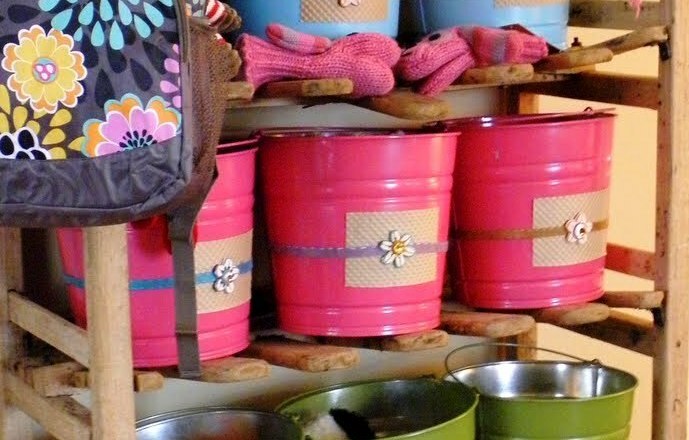 One great solution to an easy bucket shelving unit is to just find buckets that don’t taper! This pyramid shelving unit is built with precise 90 degree buckets. Stacking buckets vertically instead of horizontally in another way to make bucket shelving work. If your buckets are load-bearing you will have to dissassemble your shelves every time you want to get into your bottom buckets. The image on the right shows 6 months of food for one person stored neatly in 5 gallon buckets. The meals you can make with food stores like this won’t make it to the Food Network, but they’ll keep you alive. Alternatively, buckets can be mounted on a frame of some kind. This has the additional fantastic benefit that modules can be taken out and swapped around at will. 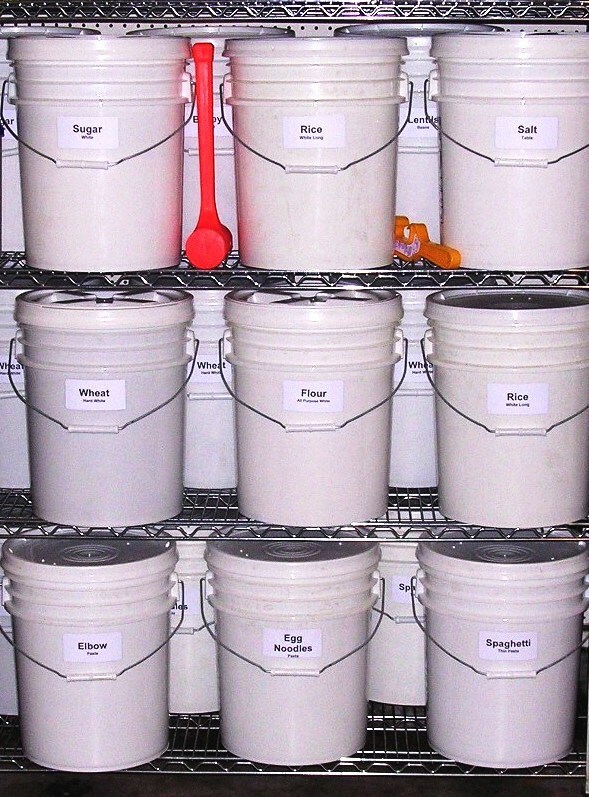 The left-hand shelving from shelf reliance is designed specifically to hold 5 gallon buckets. 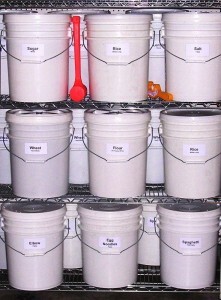 The primary benefit of shelving like this over the above method is that each bucket can be accessed individually, without dismantling the entire structure. And if you’re wanting a classier look to your shelving, no problem! Simply use a classier bucket. 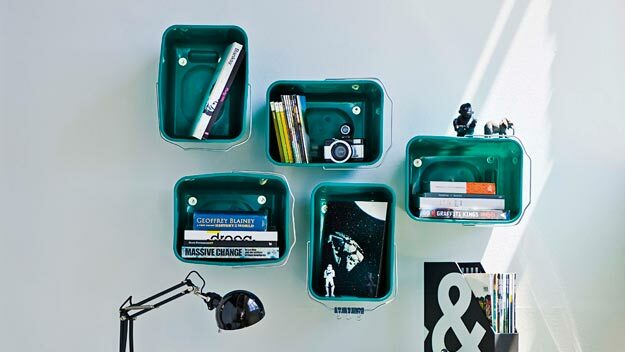 Since books are rectangles, bookshelves are best made with square buckets like shown here. This setup works great in a dorm room or office – and once you’re ready to move shop somewhere else – your packing is already done! This is one for the kids. 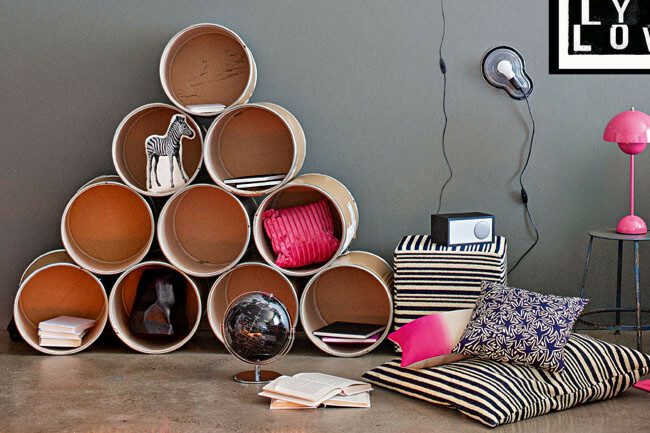 This entire cubbyhole array was creatively designed from just a few basic materials – hooks, masking tape and buckets. How many buckets do you have for one person for a year? I’d love to know as I’d like to better organize my food storage, but have no money to buy stuff. However, my local store gives away the 5 gal buckets! Since the buckets have had commercial frosting/icing in them, any tips on removing it easily – without having to use an entire bottle of Dawn per bucket. Great questions! I’m rewriting the long term food storage post for publishing tonight or tomorrow. I’ll be sure to include a precise bucket count per person per year. 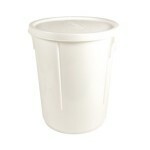 I wash buckets using VERY diluted “sunlight” brand soap which I buy by the gallon from Costco. I believe a full gallon of the stuff costs about 14$. I mix 1 part sunlight to about 10 parts water. I wash ALL buckets outside with a high-pressure hose and I would recommend using the same for your frosting buckets to remove all large chunks before using any soap at all. Thanks! And I’ll be looking forward to your food storage post. Hope you don’t mind, but I’ve been pinning your ideas on my Pinterest boards. Of course! Share it however you like. 5 gallon buckets stacked horizontally. alternate end to end the OD taper will nest perfectly. Stack perpenticular to wall so that the openings will be accesable..
1st bottom layer only will require shim to compensate for OD taper. All other layers will compenate (complement) each other.